The midwinter doldrums have hit, and my clients and discussion group colleagues are reporting that their hens have feather loss in large patches on their heads, necks, and backs. Many think this could be molting; however, feather pecking/cannibalism is also a possibility. I recently visited a coop in Winfield and determined that cage agression, rather than molting, was the cause of feather loss. I also surveyed the coop and gave the owner some suggestions for improving conditions. Molting Patterns A molting bird will lose feathers in cycles, and not all at once in one area. You can see this especially in a wing molt: First one feather will be lost, then the one next to it, successively down the wing. Chickens will lose their feathers in order: head, neck, breast, body, wings, and tail. You will notice large amounts of feathers in the coop and run, and new feathers will appear (covered by the old, as-yet-unshed feathers). Bloodfeathers Each new feather will have blood supply, covered by a shiny casing. As the feather grows, the bird will strip off this casing. If is very important not to break these new bloodfeathers; if one does break. pull the feather completely out and stanch the bleeding with cornstarch until coagulation occurs. Make sure the bleeding stops completely. You can read more about molting here. There are two kinds of pecking problems: self-mutilation and cannibalism. The first, self-mutilation, is seldom an issue in flocks of backyard hens. This occurs when a bird overpicks or overpreens its feathers out of boredom, anxiety, fear, or loneliness. This is often seen in lone birds, such as caged parrots. A bird who self-mutilates its feathers may also mutilate its own flesh for the same reason. Parrots are flock animals and need attention from others. Self-mutilation is often a problem with these highly intelligent creatures. Coop size: Too many birds in a small coop can lead to cage aggression/cannibalism – hens pecking one another to death. Provide 4 square feet per bird in a coop with a run and 10 square feet per bird in an enclosed coop. Breed of bird: Large breeds may bully smaller breeds, and chickens with odd features (e.g., peacomb, crest on head, or feather on feet) may be singled out. Fear: Threat of predators can trigger picking. The flock will sacrifice weak members for its own safety. Boredom: Birds need constant activity. Wild junglefowl, the ancestors of the modern chicken, continually search for food and try to remain safe from predators. If they don’t have something interesting to do, pecking can result. Newness of bird: A flock will often attack and kill new arrivals. Introductions can be tricky (or seamless!). Read more on my post Avian Introductions. Previous injury: A bird with a scabbed over area, a missing toe, or an odd wing feather may be targeted in that area. Birds are naturally curious and will pick at things that look different. Change in environment: Birds are creatures of habit. They like routine and prefer an environment that is not always changing. Sometimes addition of something new can trigger picking. Dietary deficiencies: Lack of salt, protein, methionine, and manganese can cause picking. The birds will eat one another’s feathers to supplement their nutrient intake. Always feed a balanced commercial layer ration purchased from a reputable organization. I do not recommend mixing your own feed or providing supplemental salt, methionine, or manganese unless you are certain the issue is dietary AND you have the advice of an avian certified vet. General meanness/pecking order nonsense: If the alpha bird is particularly dominant, it can lead to a deadly pecking war. As a last resort, debeaking, separation of the flock, or removal of the aggressive bird may resolve the problem; however, sometimes the other birds have picked up the habit and will continue to harass their flockmates. Sometimes flock composition simply does not work out. If you think you might have a case of cannibalism, you can examine feathers for signs of pecking (rather than molting). 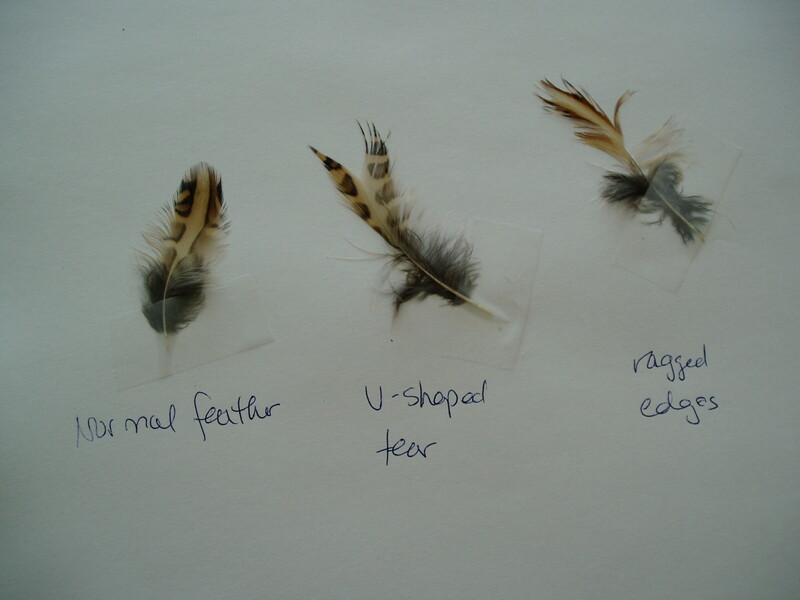 A normal feather (left) will look like the one below, smooth edges, nice contour, a bit of a sheen. A picked feather may have a V-shaped divet (middle) , indicating that the end of the feather was torn off. It may also have ragged edges (right) with bits missing on the part furthest from the body (the rounded contour), and a dull luster. A pecked bird will have multiple feathers with these problems. Get a larger coop or add a run. Remove stressors or potential threats. Allow birds out to forage. Provide places for birds to hide, such as pieces of plywood, crates, etc. Put out several feed/water stations. Provide fun, healthy foods in creative ways that encourage foraging behaviors (whole apples, baked squash partially opened, celery suspended from ceiling, live crickets). Feed a balanced commercial layer ration purchased from a reputable organization. Nutrition can be lost with pellets, so try switching to a mash/crumble. Provide a handful of dry cat chow once a day for extra methionine, a essential amino acid. Apply an antipick spray or powder. Rooster Booster Pick No More is available on line. Ok, this post is not a disrespectful one about obese women. Rather, it’s about hens that are… pudgy. You give your girls treats: corn, scratch, meal worms. That’s great! They love these goodies! It’s cute to see them running willy-nilly to get the good stuff. Life is good. Right? Well, maybe not. Those foods things are high in fat and carbs, and feeding too much of them can leave to overweight birds. Excess fat puts pressure on organs and can interfere with the egg-laying process. Overweight hens are at risk of fatty liver disease, prolapse, heatstroke, and egg binding. You may think that hens need a layer of fat to keep them warm in colder climates, like Chicago; however, the birds come with their own down coats. Many breeds, especially the dual-purpose breeds and those with small combs, are already adapted to life in colder climates. I recently conducted a Healthy Hens visit at a home where a hen had died mysteriously. The owner was concerned that she had done something wrong and that her other birds would die, too. I checked the coop and environment and then did an exam of all the live birds. I thought one of them felt a little pudgy. Then I conducted a necropsy to try to determine cause of death. When I opened the abdominal cavity, I found it was packed with yellow fat deposits. Everywhere. I’ve never seen that much fat on a bird. The living hens’ pelvic bones, which are a good indicator of body weight, felt very well cushioned, indicating that they also had high body fat. See that they get exercise. Like humans, chickens need exercise to burn calories. Give them out-of-cage time or build a large run for them. Reduce the amount of carbs they get. Cracked corn, scratch, and whole grains are good to feed in the winter, right before the birds go to bed. They should not be a regular part of the diet if your birds are overweight. Increase the amount of vegetables. This provides calories without excess carbs. Eliminate high-fat treats. Mealworms and other high-fat treats are yummy, but they pack a punch in terms of fat. Feed a balanced layer ration. Put your hens on a nutritionally balanced layer diet, with proper amounts of calcium, magnesium, phosphorus, and other key nutrients. A mature, dual-purpose (egg and meat) bird, will ideally consume between 3 and 4 pounds of food per week. Limit the amount of food. It is always better to provide layer ration as free choice (at all times). This ensures that all your birds get food. However, if they are overweight, you can limit the layer ration to what they are able to eat in 20 minutes, two times per day (morning and evening). Note: Chickens will eat more during the winter in cold climates than in the summer. In cold weather, metabolic activity increases to help them maintain body temperature. During heat waves, they will eat less. Your flock needs the same dietary care as you do: high on nutrient value and low on junk food. Keeping your birds’ diet on track will keep them healthy, happy, and providing you with breakfast!